If you're an Android user who finds himself desperately in need of a Windows app on his smartphone or tablet, you'll be glad to know that CrossOver and Wine are coming to Android by the end of the year. In a nutshell, this means that some Android devices will be able to run full Windows apps. For years, Linux and Mac users who desperately needed a Windows app that's not available on their operating have found success in using CrossOver and Wine, tools that can emulate a Windows environment. If you're not familiar with CrossOver and Wine, then what you need to know is that Wine is an open-source Windows compatibility layer that allows Windows apps to run on other operating systems. CrossOver is a custom-made, commercial version of Wine created by CodeWeavers. Unfortunately, CrossOver and Wine can only work on Intel's x86 and x64 chipsets, which severely restricts the number of compatible Android devices. The large majority of Android-based smartphones and tablets make use of ARM CPU architectures, which make it impossible to natively run x86 code. The alternative, running Windows apps on a virtual machine, will be much slower compared to CrossOver's compatibility layer. Note that even if you're the owner of the Intel-powered Asus Zenfone 2, this doesn't mean that your handset will be able to run every Windows app currently out there. Fortunately, many must-have Windows apps are compatible, and you can check out the full list by heading over to the link here. Another drawback to take into consideration is that many Windows apps are not optimized for touchscreen devices, a thing that those of you who own a Windows tablet are well familiar with. Nevertheless, running apps such as Ableton Live on an Android smartphone or tablet will certainly be a nice feature to have, especially since many of the big-name Windows developers are starting to make apps that don't need a mouse and a keyboard to work as desired. As previously mentioned, the first preview of CrossOver for Android will launch by the end of the year. Anyone excited? I think we need other way around: windows based devices to run android apps! I guess running windows app natively will be better. I hope android stops using vm someday. All this excitement about Windows 10 working on ARM CPUs and all I've seen is a bit of work done on Raspberry Pi. Emulation, a bloated solution for a obese OS.. This promises to have all the support of a house of cards on a race track. I bet these devs can't wait to pick through what works and what doesn't on 300 differently speced devices. Interesting, let see how this turns out! 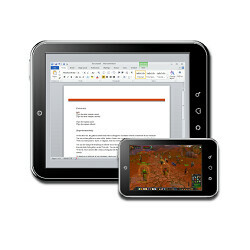 Some user would just prefer windows tablet and likewise some would just prefer android tablet or iPad. Its good for have choices. Personally, i like to play with all three.